Patience is a virtue, I can't say that enough in regards to this post. I have literally watched these two cards on eBay for nearly two years now. As of today, they are finally in my hands, and for a great price, a steal if you ask me. 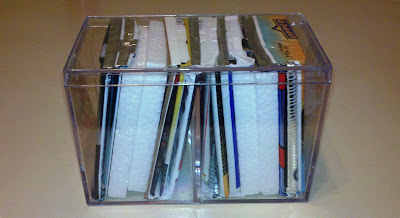 These cards had been listed as BIN's by the same seller, going through countless 30-day cycles. The Selivanov was listed at $14.99 and the Kazarian at $24.99, both of which are pretty high, at least compared to what I've gotten most of the other Super Scripts for. The Selivanov ended up only costing me $4.99. The Kazarian also only set me back just $4.99. The Kazarian is the first CHL prospects Super Script I've been able to pick up. These suckers are hard to come by, I've actually only seen two or three of them on eBay since I started the project. All of those had ridiculous BIN prices, so I never went after them. These two bring the Super Script collection total to 26. The great thing about them coming from the same seller was combined shipping, as this particular seller only charged shipping on the first card, then any others were free. That meant I got both for just $12.98 delivered. I'll take that any day. So how cool is that? This was the last place I thought I would find a good candidate for this project. This is now one of the oldest cards I've found for this project. Gotta love the old school pads, look how small they are compared to today's equipment. 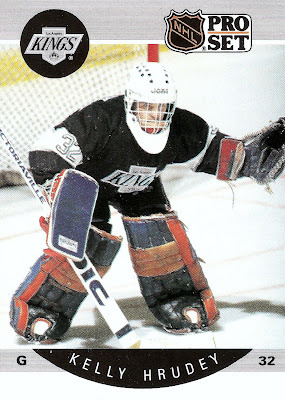 The reason for the mismatch in Hrudey's equipment was a trade from the New York Islanders to the Los Angeles Kings during the 1988-89 season. 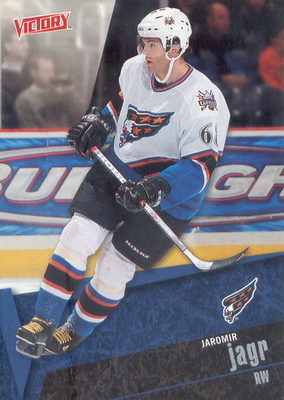 He would go on to play seven more seasons with the Kings before signing with San Jose for two seasons. This just goes to show you that there is still a place for cards from sets like this, even if there are a million copies of each. Now I'm curious to see if there are any more Gallimaufry candidates from Pro Set. 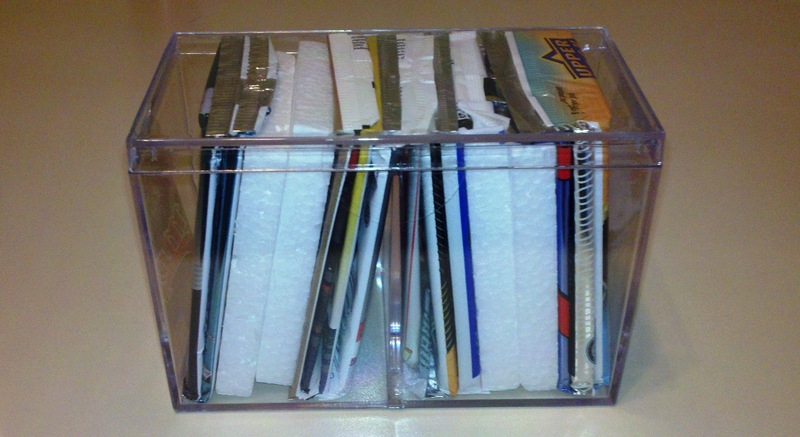 Or any other junk wax sets. Time for the second of the twelve packs I got in my value box from Target. This one was definitely an upgrade over the first pack. 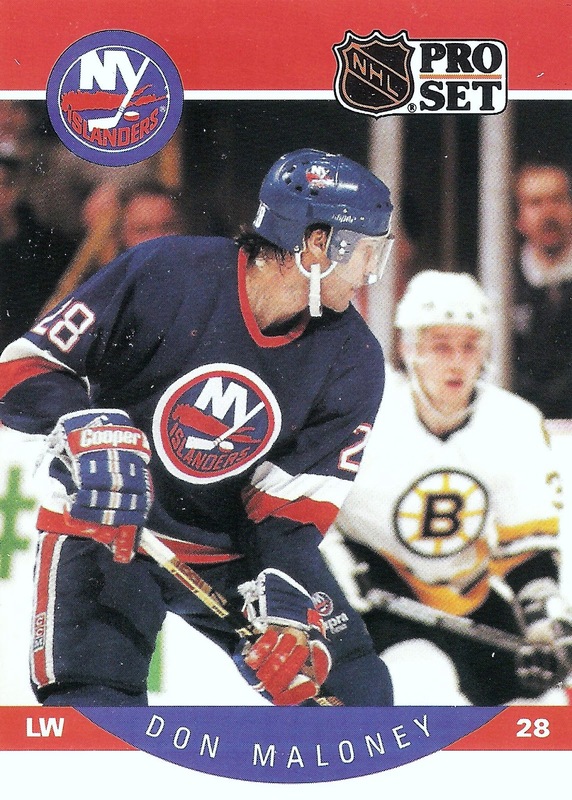 At least this one was a legitimate set featuring NHL players with their respective NHL teams. Plus, who doesn't love Pro Set? This is one of the sets I remember collecting as a kid when I was first getting into the hobby. At that point I didn't care who was even on the front of the card, let alone the fact that they were from the so called junk wax era. All I know is that they helped get me hooked on this great hobby. Who knows, maybe I'll go back and try to complete this set one of these days. Gotta love the old school wrapper. One thing I do like about the older products like this is the number of cards you get per pack, granted there were no inserts or GU stuff back then. Let's see what I got as far as the hottest cards on ice. 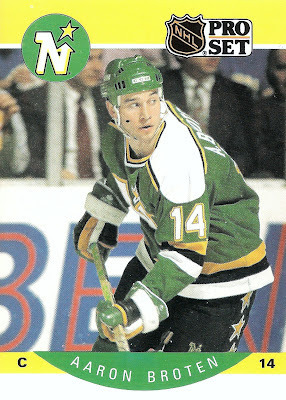 The first one I have features Aaron Broten of the Minnesota North Stars. 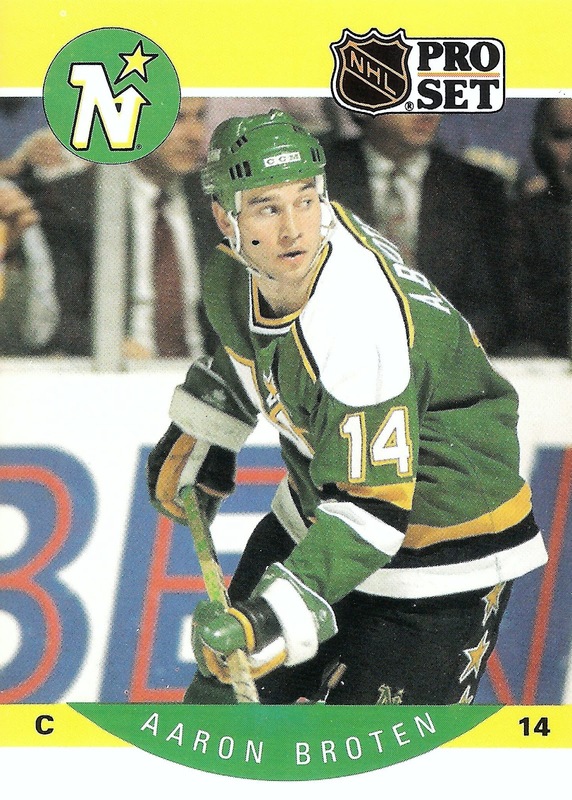 While he only appeared in 35 games with the North Stars, Broten played more than ten years for the Rockies, Devils, Nordiques, Maple Leafs, and Jets. Next we have another North Star with Ulf Dahlen. 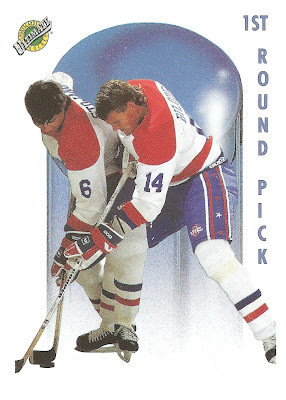 He was originally selected 7th overall by the Rangers in 1985. 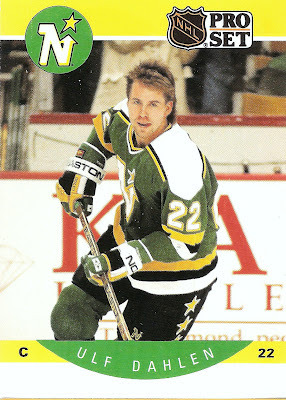 He played four seasons with Minnesota from 1989-93. 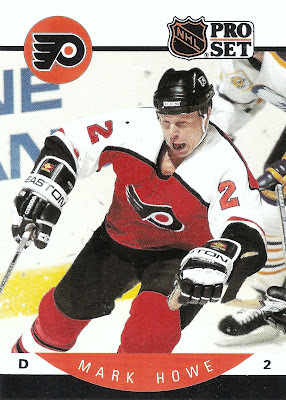 Here's one of a guy you might recognize, 2011 Hockey Hall of Fame inductee and son of Mr. Hockey, Mark How. This one has a nice action shot of the former flyer. 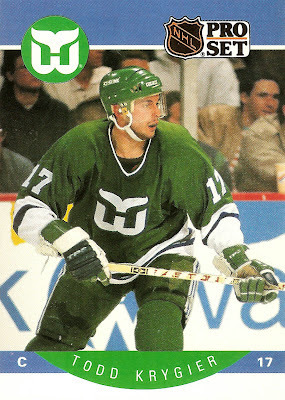 Here's a name that may not be so familia, Todd Krygier of the Hartford Whalers. The former NHL'er turned insurance agent put up 100 goals and 143 assists in 543 career games. 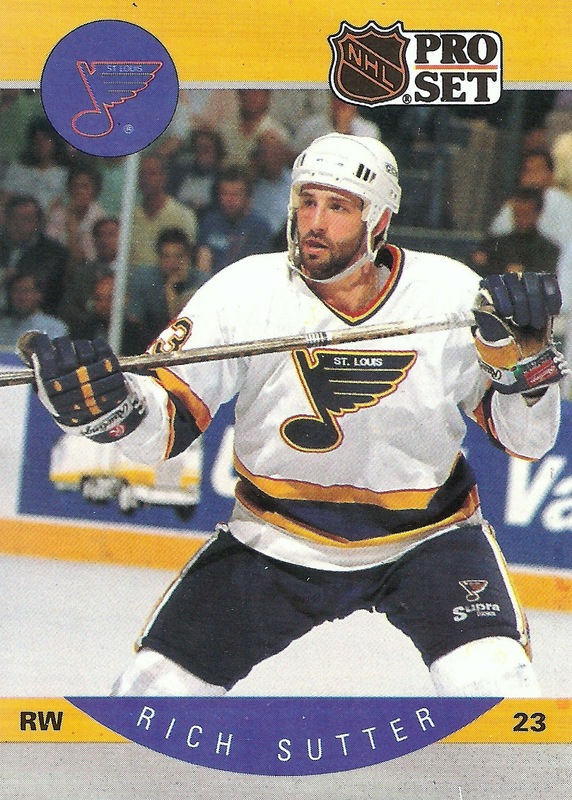 The next one features former defenseman Doug Lidster. He was drafted in the 7th round of the 1980 draft and went on to play 16 seasons, capturing 2 Stanley Cups. Then we have current Phoenix Coyotes GM Don Maloney pictured during his days as a player with the New York Islanders. He was actually their GM from 1992-1995. 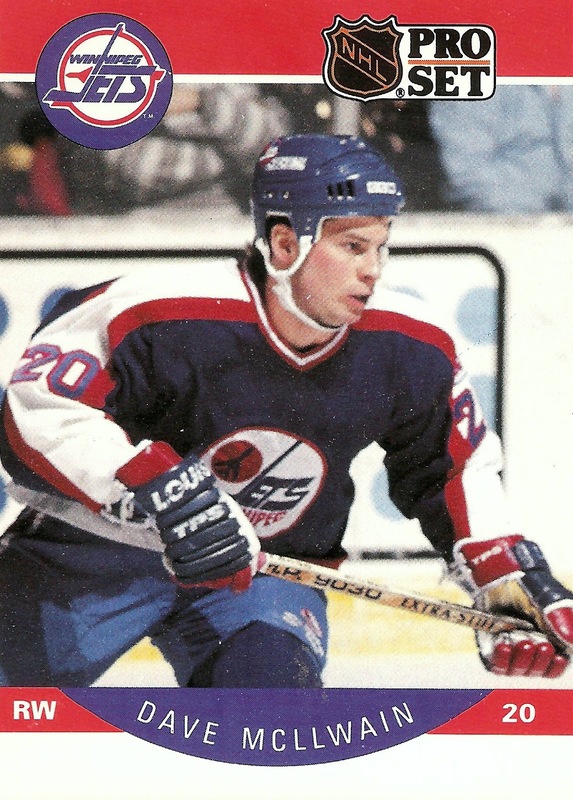 Here's one that features a legitimate Winnipeg Jet, not one of the frauds that are there now as the Jets 2.0 (a.k.a. Thrashers). McLlwain played three seasons with the real Jets. 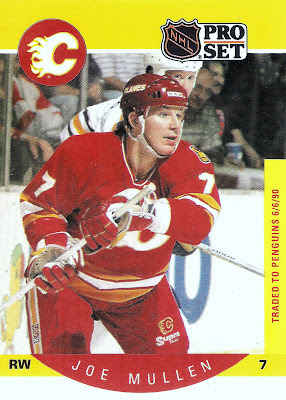 Former Calgary Flame Joe Mullen is another hall of famer to add to the list from this pack. 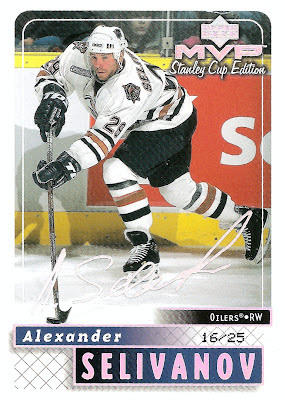 He was inducted back in 2000 alongside Denis Savard. Then we have former St. Louis Blue Rich Sutter, the twin brother of fellow NHL'er Ron Sutter. 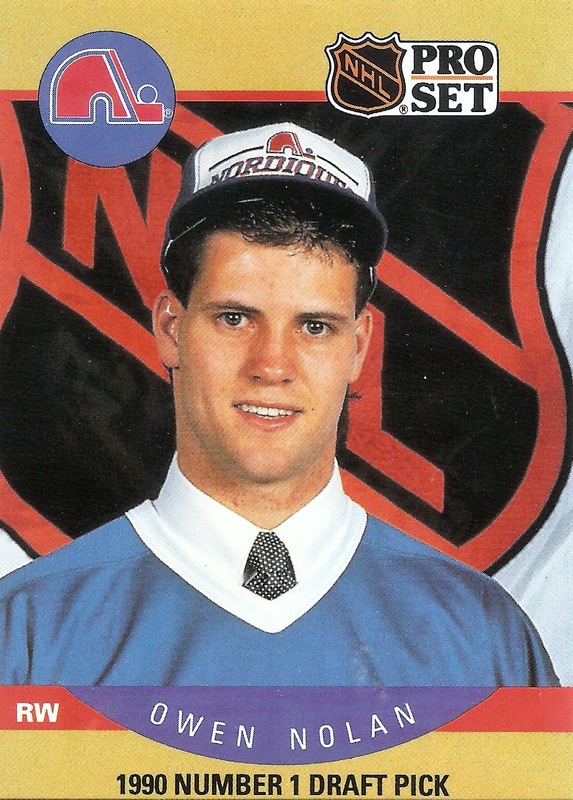 He last played with the Leafs in 1994-95 and is now a scout for the Coyotes. 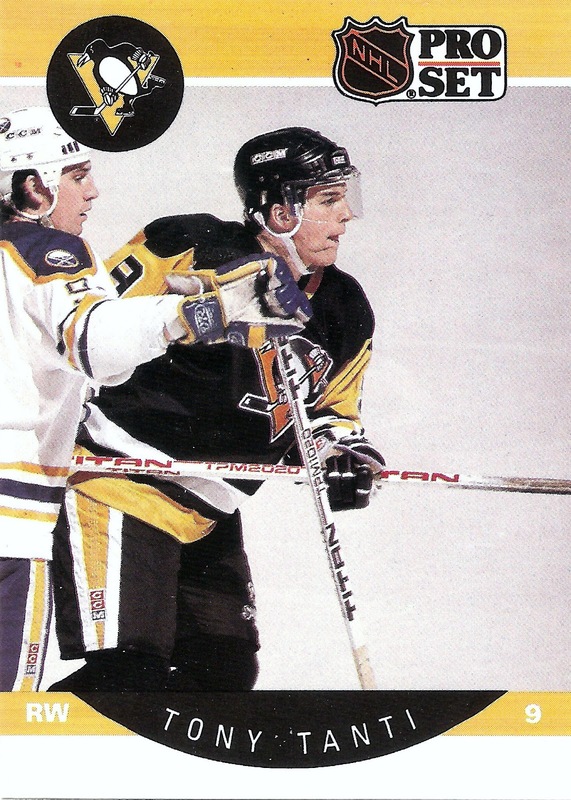 The next one features former Penguin Tony Tanti. He was originally drafted by the Blackhawks and went on to play for the Canucks, Penguins, and Sabres. 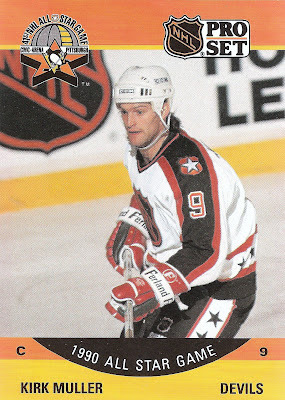 Here's another name that should be easily recognized, 500 goal scorer Pat Verbeek. I will always remember him from his days with the Wings where he scored his 500th. Finally, we have something a bit different from the main set. 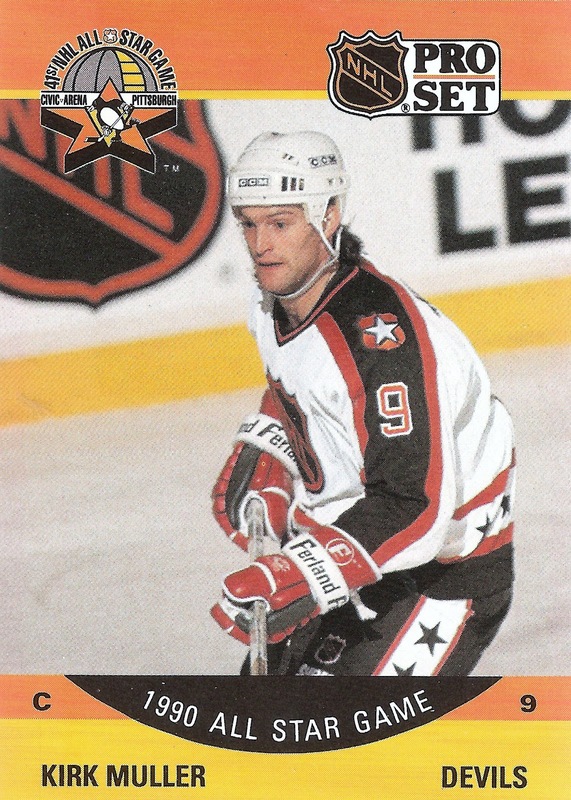 This is one of the All-Star Game cards, featuring former New Jersey Devil Kirk Muller. Here's another that's different from the rest. 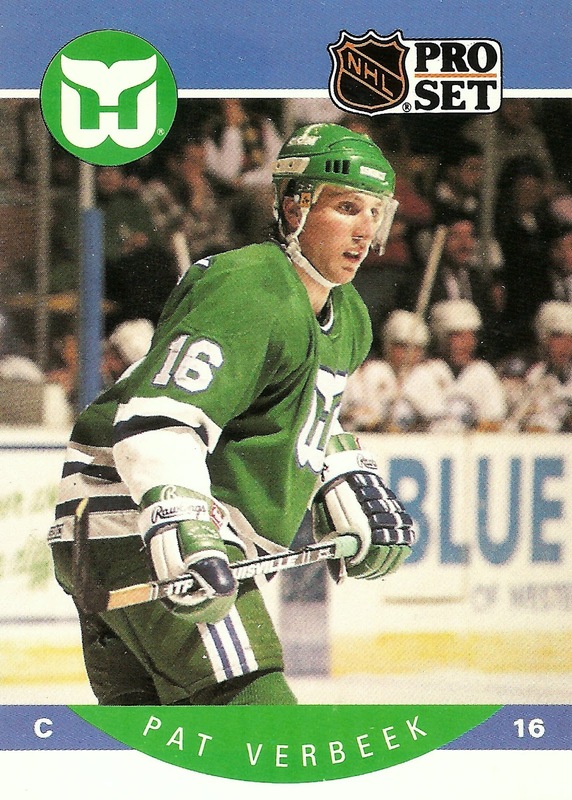 It features the number one pick from 1990, Owen Nolan. Too bad the picture is so far off center, otherwise it would look great. Lastly, we have my favorite card from the pack. 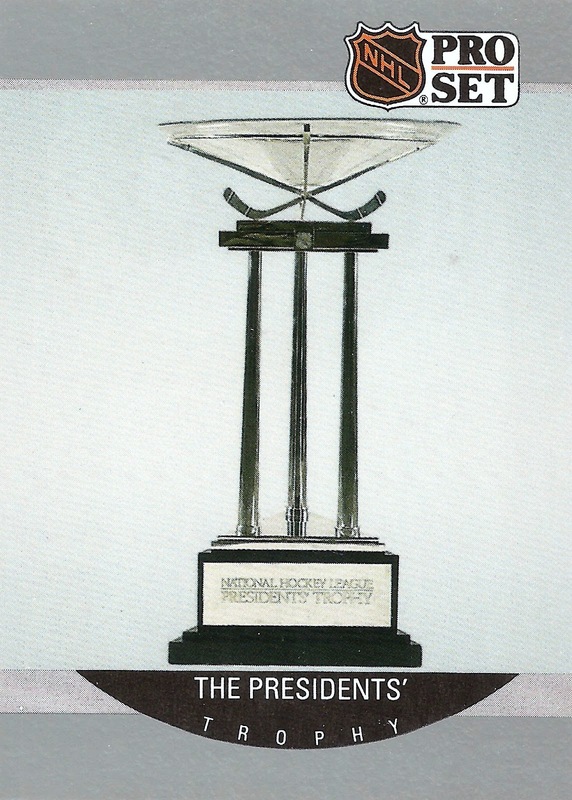 A trophy card that highlights the Presidents' Trophy, given to the team with the best record during the regular season. So overall not a bad pack. 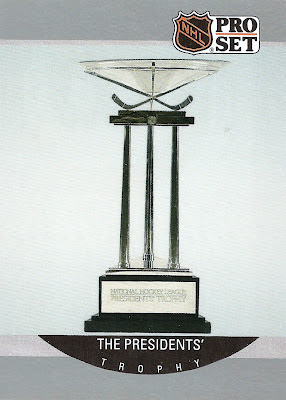 Like I said, my favorite of the bunch is probably the Presidents' Trophy card. The rest are just a reminder of the junk wax era, but did still make for a fun break. 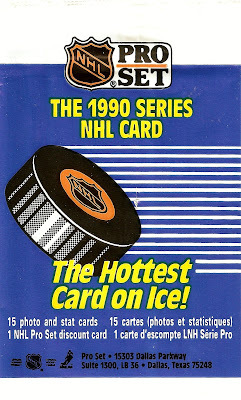 By the way, if you want to see what makes these the hottest cards on ice, click here. 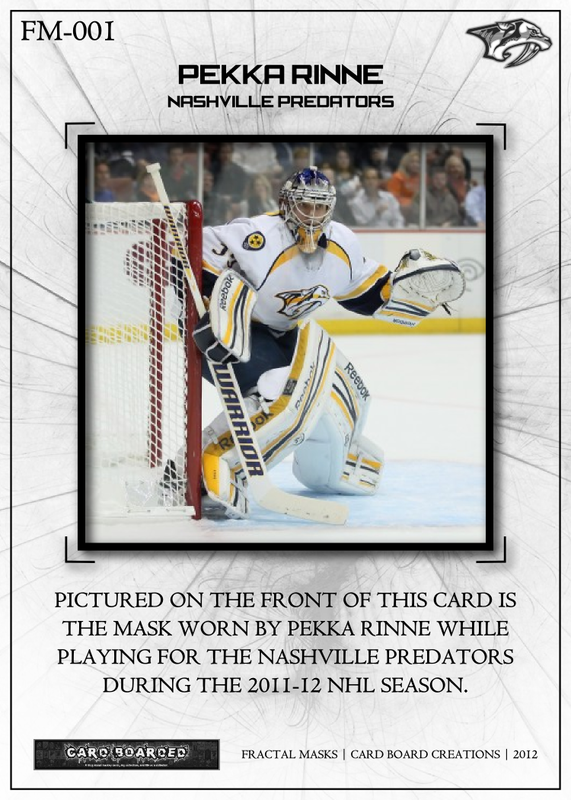 Recently I was asked by a fellow member of SCF (Sports Card Forum) about them printing some of my custom card designs, particularly my Fractal Mask designs. 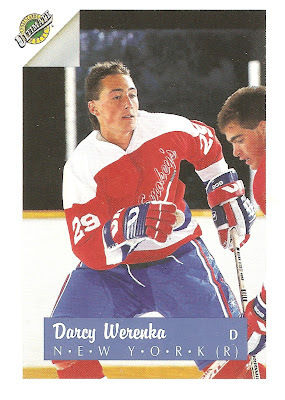 Apparently he knows a print shop that can produce decent quality printed hockey cards. My question for you guys is what should I do here? Have you been in this spot before? I am definitely interested in seeing what my designs would look like on an actual piece of cardboard, but at the same time I do not want to worry about copyright infringement or any of that mess with all the pictures and logos I've "borrowed" for these designs. Have any of you that design and print custom cards had any issues with printing them? The other thing is the guy offered to pay me for the designs, which I am really leaning against at this point, just to avoid any possible legal issues. Instead he threw out the option of printing me my own set for my efforts, which in my opinion is much cooler anyway. I think for the sake of simplicity, I will keep the same fractal on the back of every card in the set, just to make it so I only have one back template file to deal with. Other than that, I'm open to any suggestions you guys have about the design. For my fellow bloggers out there, have you ever picked up a card or cards, brought them home, then completely forgot to scan and show them off? Well, I did just that with some of the stuff I was able to grab the last time I went to the LCS. Click here for more on that post. 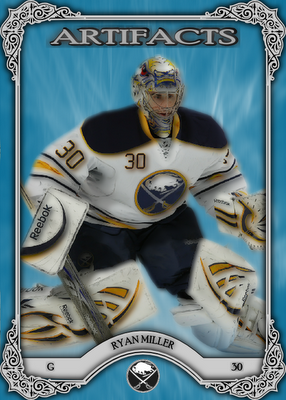 As the title of the post suggests, I've got some more cards for my growing Goaltending Gallimaufry project, which is slowly closing in on the century mark. 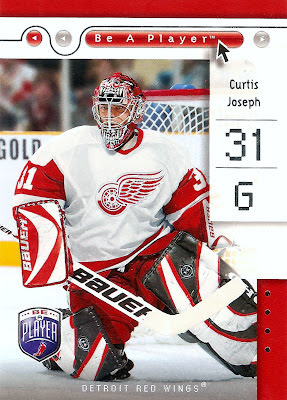 The first was this Curtis Joseph from 2005-06 BAP. It's got a great shot of Cujo and his black pads from 03-04. 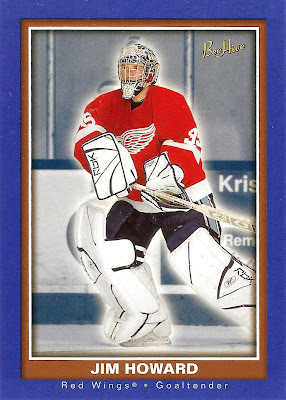 Next we have one from the premier goalie set, Between the Pipes, this time from the 2002-03 edition. It features Craig Anderson of the Chicago Blackhawks with some awfully mismatched blue and yellow equipment. Not sure what it's form though, anyone know? That's it for now, although I do have another one of these posts in the works after the value pack box I've been slowly posting here. The only thing I will say about it is that I never expected it to come from the pack that it actually did. Finally, time to get these posts going. I was kind of getting worried that I would simply forget about them and have bought a $10 box of cards for nothing. 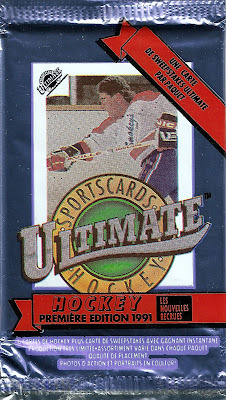 Anyway, I'll start off with what I think was the worst of the bunch, a pack of 1991-92 Ultimate Hockey Premier Edition. 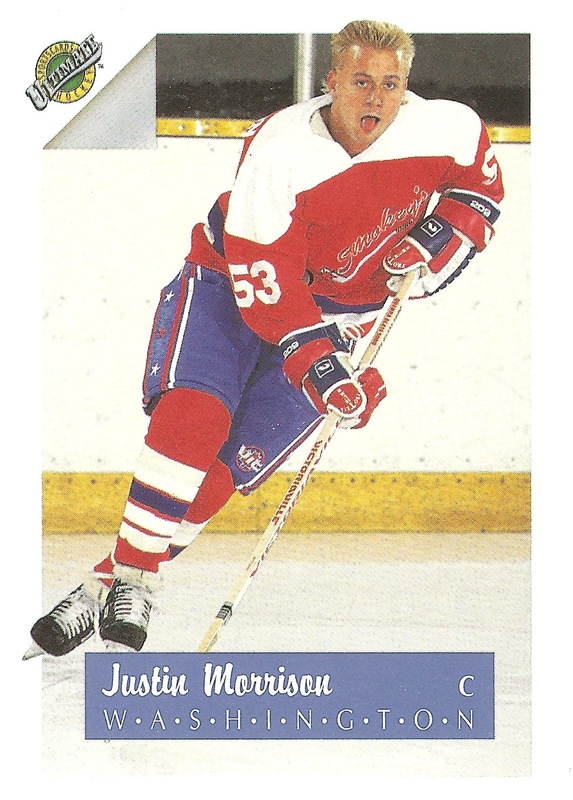 The first card was this one featuring former Washington Capitals draft pick Justin Morrison. I couldn't really find much information on him other than a bio on the Kingston Frontenacs webpage. Click here to check it out. Next was this one featuring Darcy Werenka. 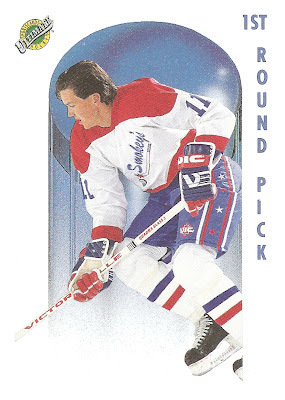 He was selected 37th overall by the New York Rangers back in 1991. While he would never suit up for an NHL club, he continued playing professionally in various leagues up until at least the 2010-11 season. Behind door number three we have former Montreal Canadiens draft pick Brent Bilodeau. He was selected 17th overall in the 1991 draft. He also never made it to the NHL, instead bouncing around the AHL, WHL, IHL, and ECHL between 1991 and 2005. 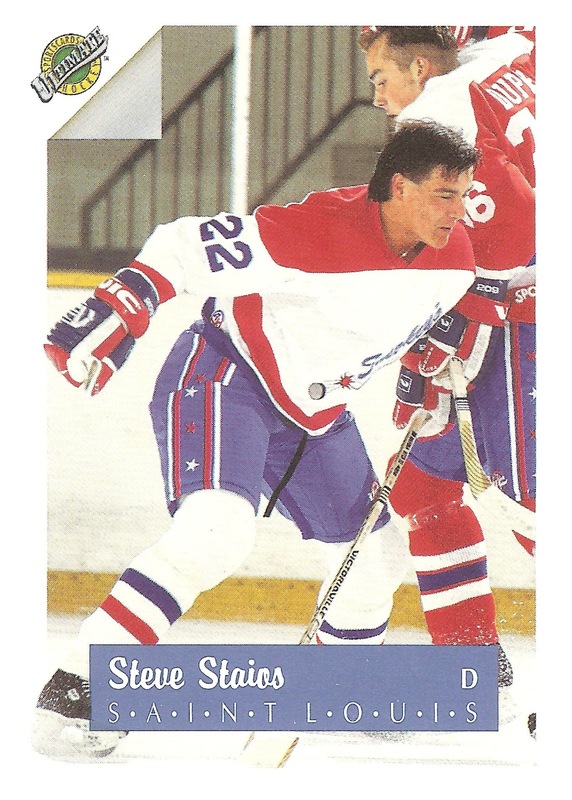 The fourth card was this one featuring former Edmonton Oiler Steve Staios. He's the first of this pack to actually make it to the NHL, where he still is today, playing for the New York Islanders during the 2011-12 season. The next two cards are a bit different than the rest in that they focus on only the first round picks. 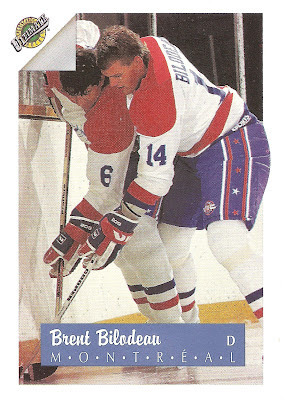 The first was this one again featuring Brent Bilodeau, although it would be hard to see that if the same picture wasn't already used on his other card. Finally we have one more NHL'er in Phillipe Boucher, who was drafted by the Buffalo Sabres with the 13th overall pick in the 1991 draft. According to Hockey DB, he last played in the NHL with the Pittsburgh Penguins during the 2008-09 season. Nothing impressive here, but it still made for an interesting break. The one thing I find amusing about these cards is the "Smokey's" getup all of the guys are wearing. Must have been a licensing thing for them to all have to wear something that cheesy, right? Man, my mailbox really does not want me to get to all of the pack break posts in the queue, does it? Today I came home to another nice pickup for my Jimmy Howard collection. This time it's another piece of my nearly complete 05-06 Beehive rainbow. One thing that this purchase reminded me of is how important patience can be in a hobby like this. I've seen this same card on eBay with BIN's anywhere from $5 to $25, but never went for them thinking I could find a great deal one of these days. Well, that day came recently and I ended up getting it for just $0.99 plus shipping. I already have the base, red, and beige versions of this card. Now I just need to track down the matte version, which is numbered to just 25 copies. I've seen one so far, and it was BGS graded at like a 9.5 or something with a BIN of more than $100 on eBay. No thanks, I'll wait that one out too.Who knows, maybe I'll get lucky with that one too. Have you ever waited years for a card to come around at a great price? Like I said earlier, I could've had this card several times over if I was willing to pay a bit more for it, but just a little patience saved me a lot of money. This is another one I ended up getting for just $0.99 plus shipping. Not a bad deal for a card that would probably set me back at least $5 or so at any of the local shops or shows, given the premium put on Red Wings cards around here. 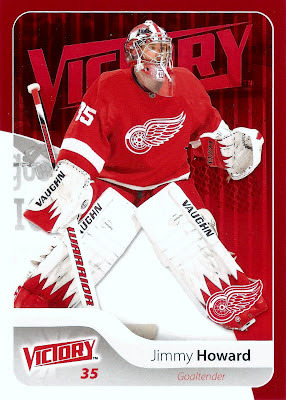 One thing I do like about the Victory reds is how well they compliment the red and white of the Wings uniforms. While it's not the contrast you would like to see for a parallel, it still looks pretty good. Now I just need to work on tracking down the black parallel. One more quick mailday post before I get to all the pack breaks I've been talking about. This is another one that I ended up getting for a really great price, I would even go as far as calling it another eBay steal. It's a Gold Spotlight parallel from 2010-11 Limited. It's the exact same as the Silver Spotlight card other than the coloring behind the word spotlight on either side of the Limited logo. The biggest and most important difference between the two, is the serial number on the back. You can't see it here but, this card is numbered 04/10. Click here to see it. Earlier I said I thought this was another steal, now what do you think a card numbered 04/10 for a guy like Howard would go for? I figured I would have to pay at least $10 for it considering some of the similar auctions I've watched in the past. Well, I ended up getting it for just $6 delivered, not bad eh? Before I get into the 12 pack break posts I've got coming up from my recent "extreme value" box pickup, I've got a few mailday posts to get to. 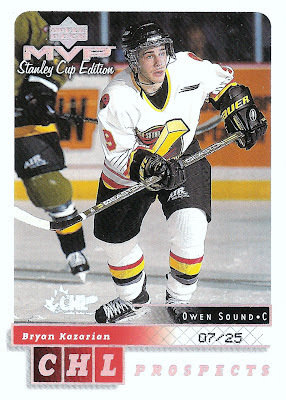 The first is one for a set I've yet to make much progress on, 2005-06 UD Rookie Showcase. 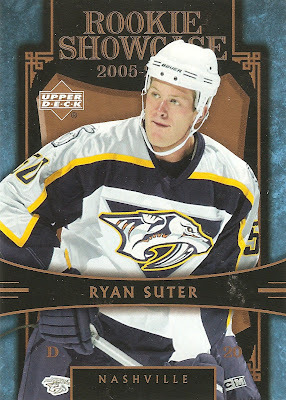 I ended up winning this Ryan Suter, unintentionally at that, for just $0.99 plus shipping. I say unintentionally because I threw up another "placeholder" bid at $0.99 figuring it would go at least a bid or two higher than that. Well, it didn't, but that's ok with me. It's a great looking card and I will definitely take it for less than a dollar. This is the second card I've bought that's part of this set, but the other one was for my Howard PC so this is really the first one I can knock off the want list. At this point, I've got just one of the 36 in the set. Now I just need to start tracking down the other 35. The worst part about building this set is going to be tracking down the Crosby that's consistently been on eBay with BIN's in the $50 range. Plus, he's the last player I want as part of my collection, but sometimes you have to deal with that to complete a set, right? Do you ever get an itch to just open some packs? Doesn't matter what product, as long as there are a bunch of packs to bust open, never knowing what's inside. Well, I got that itch the other day while I was at the local Target. So, as usual, I wandered down the card aisle as we were checking out thinking about grabbing a few of the cheap single packs. As I was looking over the sports card section of the aisle, which is actually less than half of it considering all the kids gaming cards and what not, I found some of the extreme value repack boxes. 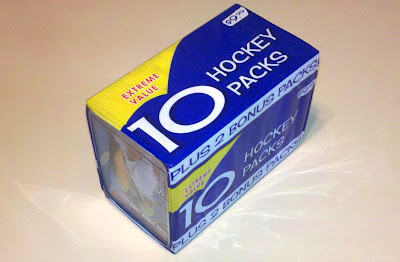 They were marked $9.99 for ten packs, plus two bonus packs. That's about $0.83 per pack for the arithmetically challenged. Here's a look at the outside. Before you used to be able to see inside to at least have a chance at guessing what's in there assuming you know your wrappers. Now it's completely wrapped up other than the two ends. On one end was a pack of 10-11 UD Series 1 and the other a pack of 07-08 MVP. Nothing horrible there so for $9.99 I was in. 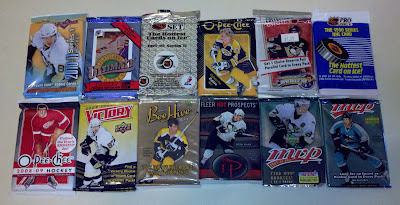 Stay tuned to see what was in each of the packs. Some were duds, but some had some cool stuff, that's all I'm going to say for now. 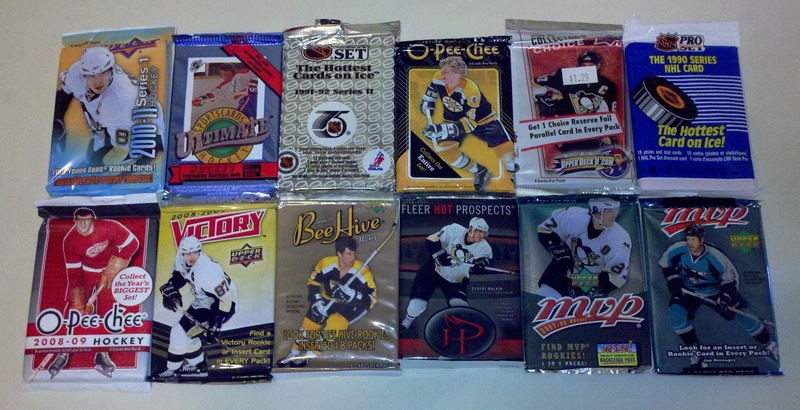 By the way, how do you guys feel about these "extreme value" repacks? I love them because for just ten bucks I get a bunch of cards and a good 10 posts out of it. And who doesn't love opening packs? Usually my custom set designs are one of two things: a straight up recreation of an existing set or a unique design of my own, even if some of them are inspired by other sets out there. The latest project is a bit of a hybrid. As you can tell by the title, this one has something to do with UD Artifacts, which has had some really nice designs. It actually stared back in October of last year when I was playing around with a few custom set ideas and just happened to be looking at some of my UD Artifacts base cards. I thought to myself, why not try and make my own version of the set? Well, after a few design iterations and staying up til 2:00 am last night, I managed to come up with a set of nine. I wanted to have a background that would stand out and I think the blue fractal does just that, wouldn't you agree? After that I added the slight fading coming up from the bottom behind the player. Then it was onto the border, which was pieced together from a sample I found online. The position, name, and number bar was pretty simple, but I added the arch in the middle just to give it a little something extra. Another thing I did that is pretty neat was having the borders of the card overlap the picture, giving it a nice clean look all the way around. I also added the Artifacts word mark to the top and a desaturated team logo to the bottom. The last piece was the picture, which I added a blur effect to, that's why they look a little out of focus from a distance. You may be wondering about the choice of goalies here. The reason I chose the group that I did was just to make things easier. 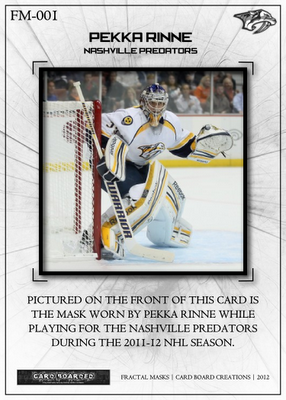 I found a Photobucket account that has a bunch of cropped player images, so I just picked through the different teams and found the most usable goalie pics, and this is what I ended up with. 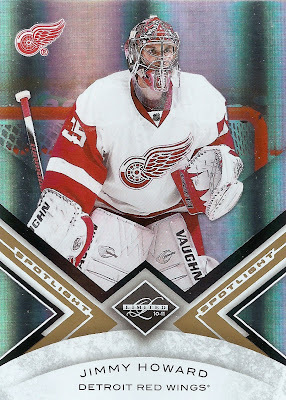 I wish I could've found a pre-cropped picture of Jimmy Howard for this set, but oh well, I'll have to save that for another project. I think my favorite would have to be the Miller. It was the first one I was working on and served as the template for the rest of them. What do you guys think? Any comments or criticisms are greatly appreciated. Before I get into today's post, I just wanted to say thanks to anyone that has stopped by the blog, helping me get to the 100,000 view mark that I'm about to cross any day now. I can't believe I've gotten that many, but I guess that shows you this hobby is still very much alive. When I come across these kinds of cards during my eBay searches, I tend to skip over them because there is just something about them that makes me not want to chase them as much as any other Howard card. Don't get me wrong, I do still want these cards as they do feature my main PC guy and I'll always welcome new cards, but for some reason I would always put a preference on cards of just Howard. What do you guys think about this? Am I in the minority here? I'm sure most of your player collections have plenty of cards that would fall into this category and I guess I'm just curious if I'm the only one out there that thinks like this. I was expecting to come home to several bubble mailers today, but that didn't happen so I thought I would jump back into this series of posts and share another jersey from my personal collection. This is another one that I've had for a long time now, and since I've lost a bunch of weight lately, doesn't fit at all. An XL is massive, so I really have no use for it anymore, although it does still look good. This was also the first and only jersey I ever bought on eBay. Hopefully that will change soon though as there are plenty of great jerseys out there for sale. I remember getting it for something like $30, which even at the time was a steal if you ask me. This jersey is obviously from the pre-Reebok era as it features the old eagle logo, which was actually pretty good looking if you ask me. Other than that, I always like the non-symmetric striping on this one, as that kind of differentiated it from some of the other jerseys in the league. The color combination is pretty nice too, although I don't think it ever made sense for the Caps to get away from the red, white and blue, right? 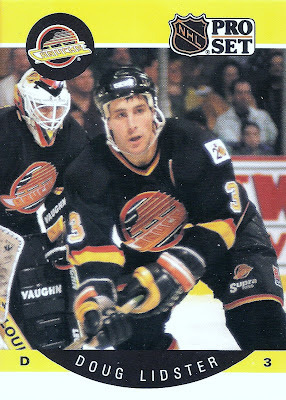 The back is where you can now see the shoulder patch, which was actually worn as a primary logo on a black third jersey for a few years, again prior to the Reebok era. Other than that it's pretty straightforward with a non-arched nameplate, typical numbers and the manufacturer mark. 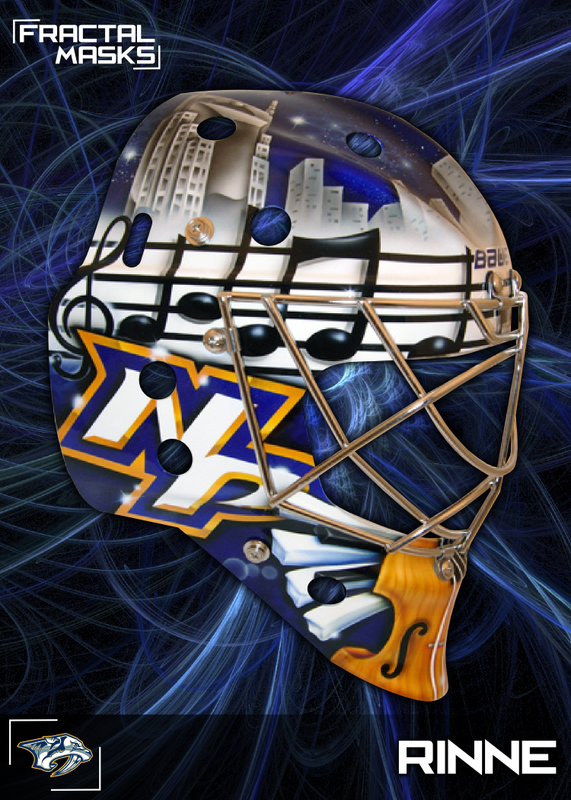 This one also has the NHL puck logo in the lower right. Now that's five down. Pretty diverse collection so far, isn't it? Well, just wait and see what I still have as it will get even more diverse with each new one I show off. Haven't decided which one I will show next, so stay tuned to find out. Here's another pick that is all about the picture on the card and not the card itself. In this case, it's a John Vanbiesbrouck MVP card from I believe 1995-96 or 1996-97 Upper Deck. 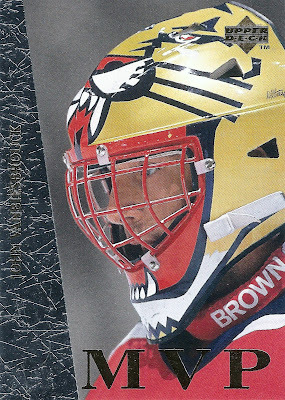 I remember really liking this card as a kid in the 90's because of the closeup of one of the most memorable masks in the NHL, at least I will always remember it. Vanbiesbrouck spent five seasons with the Panthers from 1993-98. 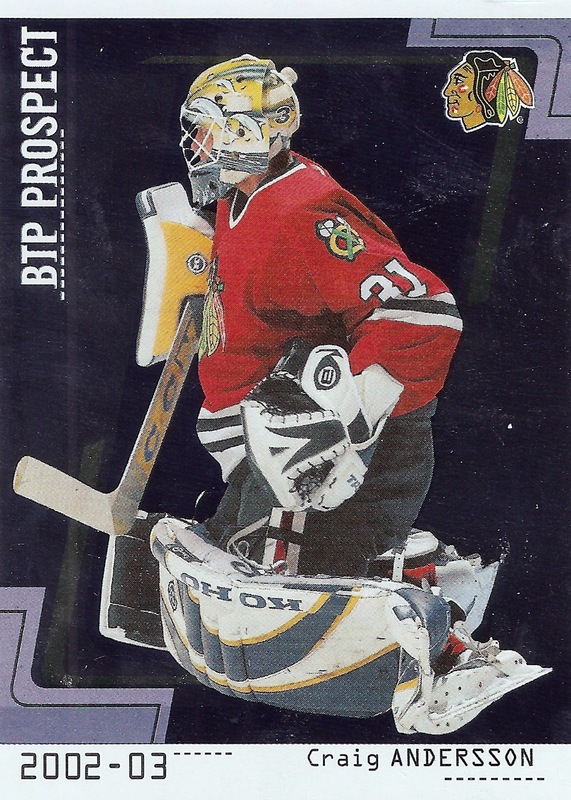 The peak of that time was probably the Panthers only trip to the Stanley Cup Finals in 1996, where Vanbiesbrouck squared off with the great Patrick Roy of the Colorado Avalanche. One of the nice things about all of his masks is the fact that they are unique, as I don't think many other goalies used the square cage, other than Kelly Hrudey who had some neat masks himself. Anyway, I thought I would show off some of Beezer's other masks. I really like the two Flyers masks with the unique take on the logo. 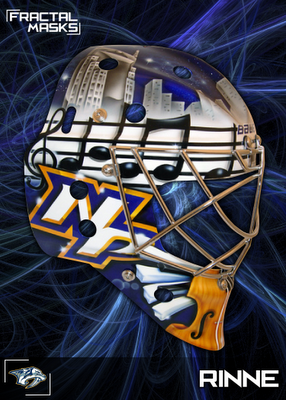 The Rangers one is awesome too with the actual bees flying in front of the New York city backdrop. 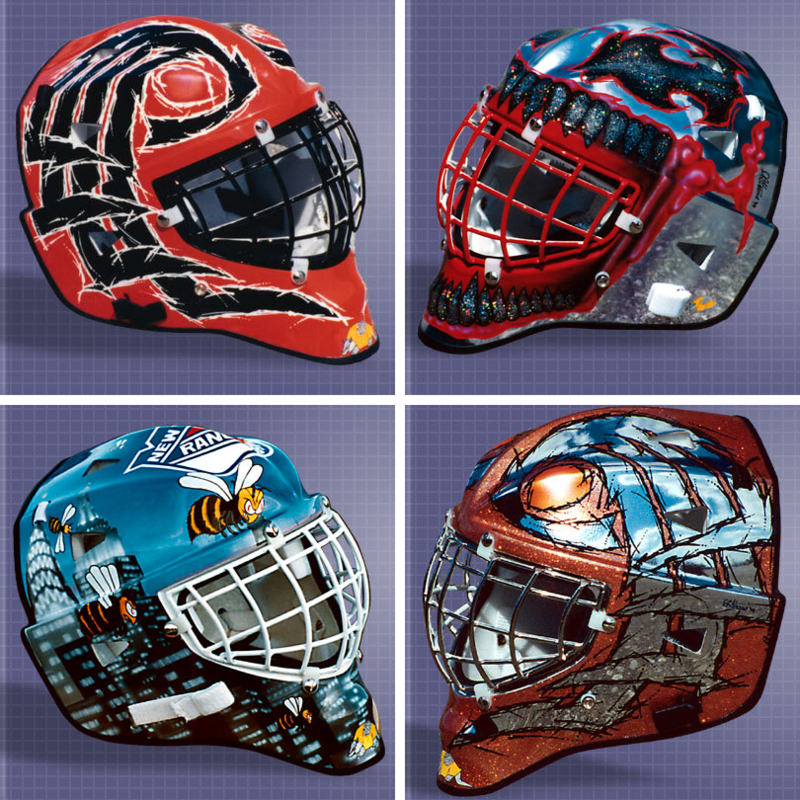 Not sure on the upper right mask, but it was listed on his Goalies Archive page. Looks like it could be from his time with New Jersey. Anyone know for sure? In a recent post I showed off a Mike Richter Mask card I managed to grab from the dollar box at my LCS. That got me thinking that I should start back up another PC project I kind of gave up on in the last two years or so. One that I've always kind of had on the back burner. I know plenty of people collect all the mask cards, so I'm not alone with this one, but it will give me something else to look for at card shows and shops in the future, especially in the dollar boxes where I've seen a bunch in the past, plus they're really cool. It's not much, but it's a start. I do at least have the very first mask set completed as I was able to grab it at a card show a while back for just a few bucks. Even though it's not the flashiest of the bunch, it's still an amazing looking set. Ideally I want to somehow frame each of the sets once they are complete. Any suggestions on how to do that? By the way, if you haven't noticed I added a new tracker to the sidebar of the blog for this project. 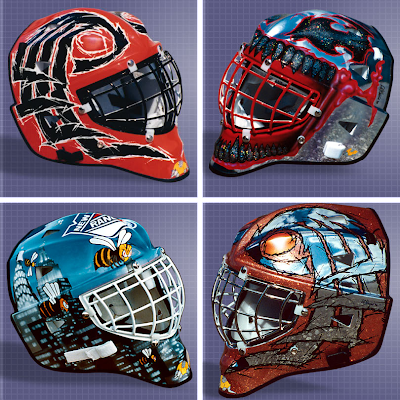 I think I've got all the prominent mask sets listed, can you think of any that I have missed? I want to stick with just the major NHL releases (ITG stuff included) here, so none of the European or minor league stuff.